Extended mesh paneling and a full mesh liner makes the Stella T-GP Plus R Air V2 Jacket ideal for summer riding. Optimized for a women’s sport riding fit, this jacket is constructed from a highly durable and abrasion resistant poly-fabric main shell featuring light, class-leading protection. Constructed for an optimized women’s fit from a highly durable and abrasion resistant 450/600 Denier poly-fabric main shell for water resistance and long-lasting performance. Extended mesh panels on the torso and arms provides substantial airflow when riding for superior comfort in warmer weather conditions. Full mesh lining boosts garment’s all-round airflow capabilities and breathability. Lightweight CE certified elbow and shoulder protectors grant the jacket a sleek fit yet provide class-leading impact protection. Back pad compartments with PE foam padding (CE certified Nucleon back protector available as accessory). 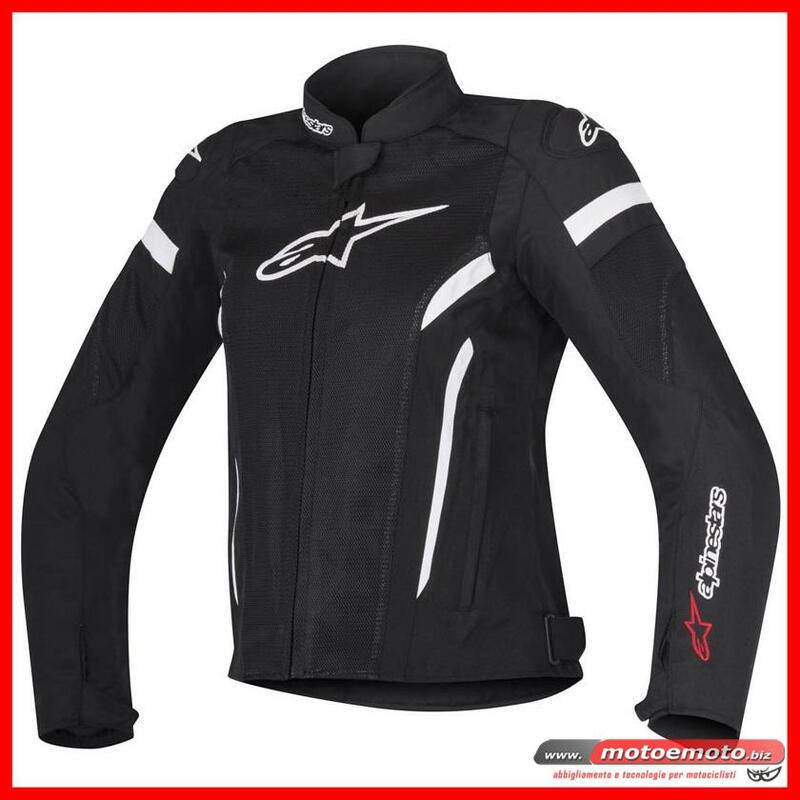 Snap button system to integrate the Level 2 CE certified Alpinestars Nucleon Back protector. Newly developed shoulder protection features over-molded advanced TPU guard layered under the outer fabric for optimized levels of protection and comfort. All protections are perforated and securely housed in mesh compartments to significantly increase garment’s air flow performance. Sport fit with pre-curved sleeve construction for reduced fatigue and enhanced riding comfort. Strategically positioned poly-fabric stretch insert on shoulders for excellent flex fit. 3D mesh collar construction for improved comfort and breathability. Velcro and D-ring waist adjustments for a secure and customized fit. Velcro wrist cuff closures allow further fine-tuning of garment’s fit. Lower rear profile design offers lumbar coverage and prevents jacket from riding up over pants. Convenient waterproof internal pocket keeps important documents safe and dry. External, large-opening front hand pockets are zippered for peace-of-mind closure. Multiple internal compartment pockets feature velcro closures for additional security. 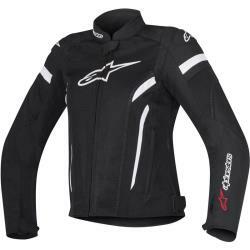 Waist connection zipper allows attachment to Alpinestars riding pants. Reflective details for improved rider visibility.